A new era of NGS has begun with the focus shifted from discovery to integration into the clinic. As you have probably noticed, there’s been a major shift in the focus of next-gen sequencing over the past couple of years. First it was all about new genomes, new techniques, and discovery. Now it’s all about translation. We are entering a new era in next-gen sequencing, one in which NGS technologies will not only be used for discovery, but will be integrated into clinical care. A review in the latest issue of Human Molecular Genetics discusses NGS-enabled cancer genomics from the clinician’s point of view. 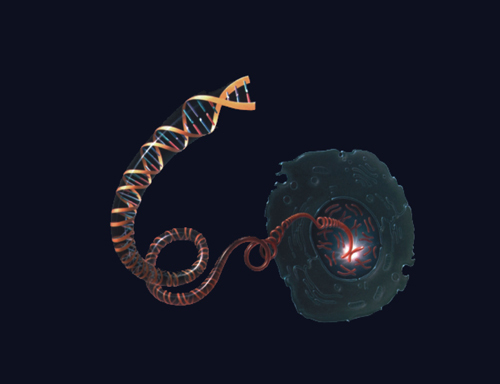 In it, the authors highlight recent findings from large-scale cancer genomics efforts—such as the Cancer Genome Atlas—and offer their perspectives on the significant challenge facing us: translating the knowledge from such massive “oncogenomic” datasets to the clinic. Frequent mutations affecting TP53 (37% of tumors) and NF1 (14%). A subset of tumors with epigenetic abnormalities (MGMT promoter methylation) and hypermutation. Gene expression-based definition of four subtypes: proneural, neural, classical, and mesenchymal. Nearly all tumors had mutation and/or deletion of tumor suppressor TP53. Nine further genes, including NF1, BRCA1/2, RB1, and CDK12 were significantly mutated. Ovarian carcinomas also harbored extensive copy number alteration and promoter methylation. 16% were hypermutated: 3/4 with microsatellite instability, hypermethylation, and MLH1 silencing; 1/4 with mutations in DNA repair genes. Frequent alteration of the WNT, MAPK, PI3K, TGF-B, and TP53 pathways. 24 significantly mutated genes, including known (APC, TP53, SMAD4, PIK3CA, and KRAS) as well as novel (ARID1A, SOX9, and FAM123B). Very high mutation rates (~360 coding mutations, ~165 rearrangements, and ~323 CNAs per tumor). TP53 mutations in almost every tumor. Frequent alteration of CDKN2A/RB1 (72%), PI3K/AKT (47%), and squamous differentiation (44%) pathways. 7% of cases with EGFR amplification resulting in sensitivity to erlotinib and gefitinib. Significantly mutated genes included classical ones (PIK3CA, PTEN, AKT1, TP43, etc.) as well as novel ones (TBX3, RUNX1, CBFB, etc.). Key differences in mutation patterns between luminal A, luminal B, Her2-enriched, and basal-like subtypes. Frequent mutation of TP53 and PIK3CA genes (29%). Uterine serous tumors and 25% of high-grade endometrioid tumors had many CNAs and frequent TP53 mutation, but low DNA methylation changes and progesterone/estrogen receptor expression. Most endometrioid tumors had few copy number alterations or TP53 mutations, but frequent mutations in PTEN, CTNNB1, PIK3CA, ARID1A, KRAS, and novel SMG ARID5B. A subset of endometrioid tumors had a markedly increased transversion mutation frequency and hotspot mutations in POLE. Tumors fell into one of four groups: ultramutated, microsatellite instability hypermutated, copy-number low, and copy-number high. A systematic analysis of 3,281 tumors from 12 cancer types by Kandoth et al., offered a global picture of the genomics of common human cancers. Many tumor types had mutations in chromatin remodeling genes (MLL2, MLL4, or the ARID gene family). TP53 was the most common mutated gene overall. Mutations in that gene and six others (BAP1, DNMT3A, HGF, KDM5C, FBX7, and BRCA2) were significantly associated with poor survival. Large alterations (CNAs, SVs), clearly have an important role in tumor biology, and gene/miRNA expression profiling allows stratification of tumors into subtypes, often ones that correlate with clinical outcomes. Even within one tumor type, the mutational profiles suggested that few driver genes were shared across subtypes. The broader conclusion from these and from so-called pan-can studies is that cancer represents a wide variety of diseases originating from different organs. Clustering genomic data across organs will therefore allow a biology-driven approach, focusing more on key genes and cellular pathways and less on simple tumor morphology. The real question, now that we’ve made considerable progress, is how to make use of that information in the clinic. Many institutions have launched personalized oncology programs, which consider tumor mutation and/or gene expression profiling. Early reports suggest that 30–70% of cases will harbor mutations that are “actionable” for targeted therapy or patient stratification. The poster child for this might be the identification of BRAF as a driver gene in melanoma, which led to the use of BRAF inhibitors in melanomas that harbor the V600E mutation. It’s a wonderful story, but the simple fact is that most targeted therapies didn’t emerge from large-scale genomics studies, but from a deep understanding of specific pathways involved in defined tumor types. Further, the successful identification (and targeted therapy against) a driver mutation in one tumor type does not guarantee it will work in another type. Other factors—tissue specificity, genetic environment, and tumor micro-environment—must be considered as well. In many current clinical trials, gene expression and mutation data are being concomitantly assessed for insight into patient stratification and therapeutic response. These sorts of trials are necessary to close the gap between new knowledge from large-scale cancer genomics and its application in the clinic. The feedback loop needs to work both ways: Clinical trial results should inform future oncogenomics studies as well. Beating cancer is an important but incredibly difficult mission, and it won’t be solved by one scientific discipline alone. Collaborative efforts by cross-discipline teams are going to be necessary. Let’s get going. Dan Koboldt leads the human genetics analysis group of the Genome Institute at Washington University. He started the Massgenomics blog in 2008 to write about next-generation sequencing and medical genomics in the post-genome era. Website: www.massgenomics.org. This article was originally published in the July 16 issue of Clinical OMICs. For more content like this and details on how to get a free subscription to this new digital publication, go to www.clinicalomics.com.